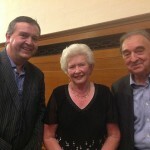 City of Birmingham Choir former General Secretary and recently retired longest-standing soprano, Sylvia Emberson was presented with a certificate and a celebratory bouquet by choir Patron and former conductor, Christopher Robinson. 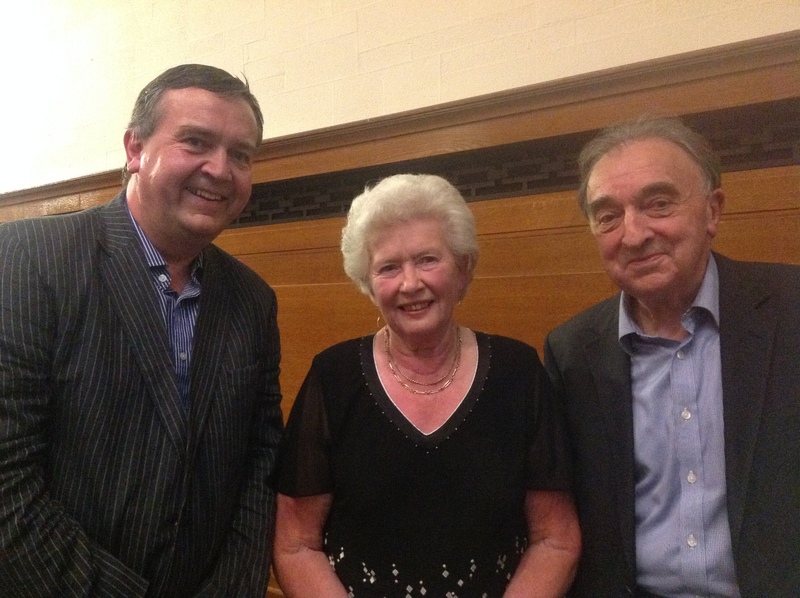 Also on the platform at our rehearsal room were choir President, Hugh Carslake, current conductor, Adrian Lucas, and chairman, David Pannell, who also presented Sylvia with Life Membership of the choir. 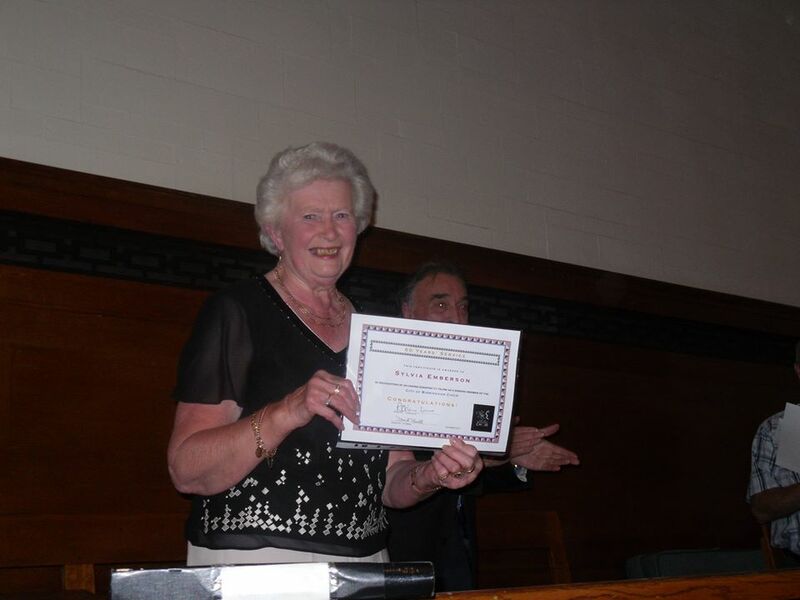 Sylvia writes, “When I was accepted as a member of City Choir in autumn 1954, little did I realise that I would still be a member 60 years later. City Choir was considered to be the best choir in Birmingham so I was very proud to be one of its sopranos (many of the ladies turned up to rehearsals in very posh hats – I was very out of place because I didn’t have one!)”More…. When I was accepted as a member of City Choir in autumn 1954, little did I realise that I would still be a member 60 years later. City Choir was considered to be the best choir in Birmingham so I was very proud to be one of its sopranos (many of the ladies turned up to rehearsals in very posh hats – I was very out of place because I didn’t have one!) The conductor at that time was David Willcocks (later Sir David) and we rehearsed in the small theatre of the Midland Institute – long since demolished – but it was on the corner of Paradise Street opposite the Town Hall. The majority of concerts took place in the Town Hall with the CBSO. I was still at school but soon left to go to teacher training college which was in Birmingham, so I was able to continue my membership of the choir. Everything we sang was new to me, so it was a great challenge but very exciting. My very first concert was in November and was a short programme for television and included Polovtsian Dances in English! The broadcast was live, of course, and went out late because the boxing match before it overran. Two weeks later we sang a new piece by Maurice Jacobson, which he conducted, called The Hound of Heaven (we’ve sung it since and it isn’t easy). This was coupled with Intimations of Immortality by Finzi. Then came the first Messiah – I can remember struggling with the lesser known choruses. How many times have I sung this? Must be about 120 I suppose. After Christmas came A Sea Symphony conducted by Vaughan Williams (the rehearsal was in the morning so that he could have a rest in the afternoon! ), my first choral symphony; Verdi’s Requiem and finally Belshazzar’s Feast – all that in the first 12 months. What an exciting start! In the following years there were many highlights, such as singing in the Royal Festival Hall on St Cecilia’s Day in 1960; being conducted by various CBSO conductors and Sir Adrian Boult; together with many first performances and landmark concerts. Two memorable concerts were the first Birmingham performance of War Requiem in 1963; and A Mass of Life (Delius) in 1993. Another highlight season was the Diamond Jubilee of the choir celebrated in 1980-81 when we sang Missa Solemnis, Dream of Gerontius and in May 1981 a very challenging piece by Messiaen called La Transfiguration de Notre Seigneur Jesus Christ. We’d not sung anything quite like this before! In May, leading up to this celebratory year, we performed Verdi’s Requiem so in the space of 12 months I sang in three of my favourite pieces. I reckon we worked hard during that year but it was all so worthwhile. In 1973 the CBSO launched its own chorus and this provided us with a new challenge – competition. However, we “upped our game” and made every effort to improve our standard and so hold our own. In 1991 Symphony Hall opened. Two years before this the committee decided that we should transfer our concerts to the new venue. Our first rehearsal scared us so much that we were afraid to sing but spurred on by Christopher Robinson we were soon in our stride. I was General Secretary at this time and worked closely with the Symphony Hall Management Team in an attempt to build up a good relationship with them – I think I succeeded. All this sounds very serious, but there have been some funny episodes as well. For instance when the ladies used to sing “The Planets” from the back stairs in the Town Hall. Someone draped a black curtain across the entrance by the organ, so that we were unseen, and there was a small hole in the curtain through which our conductor kept in touch with the orchestral conductor – no CCTV then! All this of course happened a long time ago, but I mustn’t forget that the choir continues to give exciting concerts performing both new and standard works both in Birmingham and out of town, all to great acclaim from audiences and journalists. You have provided me with immense pleasure; I’ve learned such a lot and met some lovely people both choir members and professional soloists and players – not forgetting four very talented and inspiring conductors. How lucky the choir has been to be trained by Messrs Willcocks, Davies, Robinson and Lucas. It will seem strange to sit in the audience, but that is where I’ll be from now on. I shall miss you all but thank you so much for making City Choir so special.